Material: Stainless steel(Wine Saver Pump), stainless steel material has better quality, and can be used more smoothly and longer time. temperature resistance and wide range of hardness, it also has excellent coloring! Suitable for: bottle mouth of 15-20cm/5.9inch-7.87inch, such as red wine bottle. 4 x Bottle Stoppers (all re-usable). Create an airtight vacuum that preserves wine once the bottle has been opened. Prevent the oxidation process that is responsible for the deterioration of wine. Highly durable - will tolerate regular and prolonged usage. Suitable for all but sparkling wines. With 24 Months Warranty and Provide Friendly and Easy-to-Reach Support! We created ''PROIMB'' with a goal in mind: to make the happier life , better quality and better services! Keep wine fresh: This proimb wine pump can help to create an airtight vacuum that preserves wine once the bottle has been opened, prevents the oxidation process that is responsible for the deterioration of wine, can keep wine fresh and tasty even for one week. Easy to Use: 1, Insert the Wine Stopper into the bottle. 2, Lift handle up and down to extract air. 3, Pumping the air out until you fell strong air resistance, then it is OK. You can also lay the bottle flat. Premium Quality: Unlike fragile plastic wine saver pumps, our wine saver vacuum pump is made of sturdy strong stainless steel that can last a life time, and the pump handle is ergonomically designed for easier pumping action and designed to avoid pinching that can occur with other pumps. 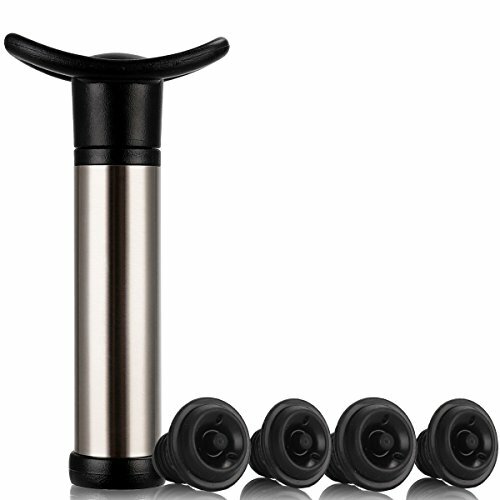 Enough Stoppers: This proimb product comes with 4 bottle stoppers, you can free to enjoy kinds of wines at the same time, and do not worry about the wine go bad. What you will get: 1 x PROIMB wine saver pump, 4 x bottle stoppers (all re-usable), and with 24 months warranty and provide friendly and easy-to-reach support! If you have any questions about this product by PROIMB, contact us by completing and submitting the form below. If you are looking for a specif part number, please include it with your message.